There is another interesting crowdfunding project available on the Bitcointalk forum for GPU miners that are interested in mining VertCoin on AMD-based video cards. 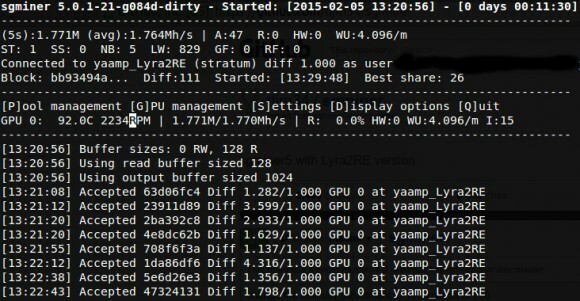 A user called pallas has made an optimized Lyra2Re kernel for VertCoin (VTC) and is taking donations and sending a compiled binary if you donate minimum of 0.02 BTC an if the total donated coins reach 3 BTC by May 1st he is going to release the source code of the kernel public. The only drawback is that apparently the binary is available only for AMD Radeon R9 290 cards where it is able to produce about 1740 KHS hashrate mining Lyra2RE coins. There are a lot of people that still use Radeon R9 280X, 7970 and others and for them a binary for the 290 is not very usable (it might work on 290X though), so this will limit the use of a compiled BIN, unless binaries for other cards are also made available. The compiled kernel binary is designed to work with latest djm34 sgminer for Lyra2RE that needs to be compiled for 64-bit.